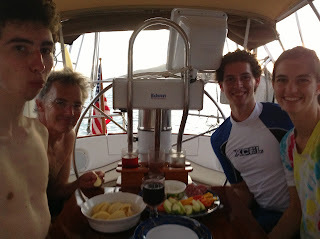 A couple of weeks later, and Michelle, Kevin and Chris arrive for their respective college spring breaks. 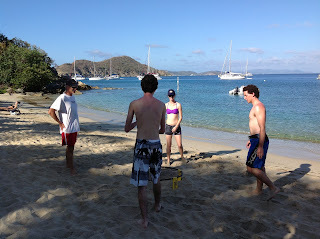 Intriguing experience, we sailed in to Trellis Bay, and walked to the airstrip at the end of the bay. Everyone arrived safely, although delayed 12 hours due to cancelled flights, and we headed out. Packed itinerary - Monkey point, the Baths, Manchioneel Bay, Norman Island and then Sopher’s hole to check out. 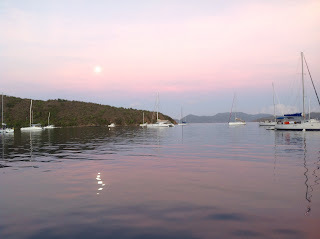 Shot across to St. John, check in to the US Vis and on to Crown Bay Marina via Christmas cove. 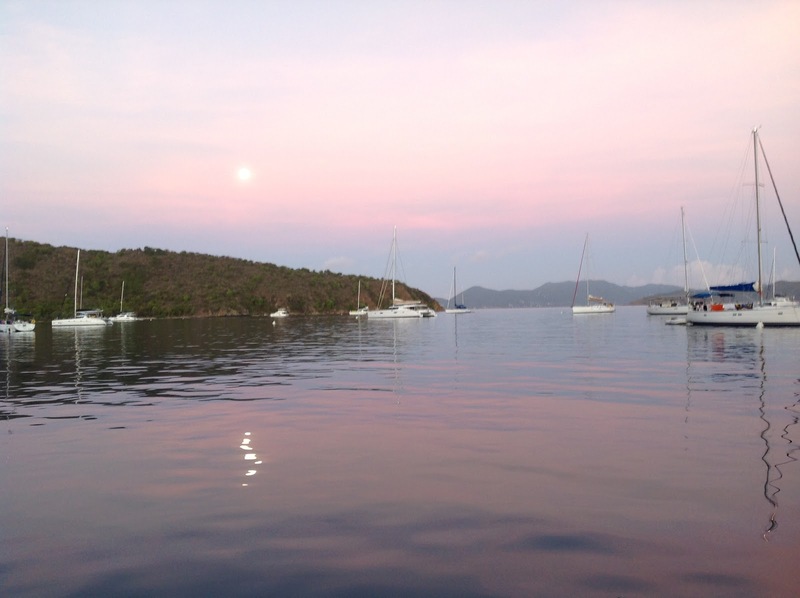 On left - the Cat whisperer strikes again, and on Right, Moonrise at Norman Island. A Norther’ had been blowing, and many anchorages were very uncomfortable. Not the best for sleeping, but everyone had a great time. Checking in to Cruz Bay was a fascinating ordeal. First had to find a place to anchor, then shoot in via the dingy, present our passports and dash back to the boat. Ya, right. Step 1 – Anchoring: Not at all clear where or how; which sardine can has the least sardines packed into it? Then into the dingy without throwing all the passports and documents into the drink. Yupp. Almost lost everything. Dash ashore keeping dry – in the rain…. And then find the immigration building…. Well, we did manage, but BP probably a bit high all round. The time with family was fantastic. 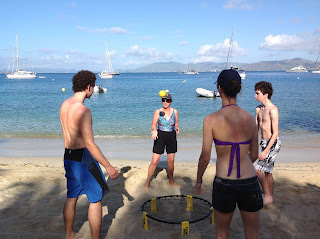 Many games of spikeball required, and I claim to be all around champion which may or may not be contested by others!!! The approach to Crown Bay Marina was difficult – the wind started to blow hard, and in the confusion I managed to ground the boat on a poorly marked reef. Got the fright of my life. What a crash, but we did establish all is OK except for some bruised fiberglass and ego, and some lost paint. At the end of the break, family departed back to college (another story there: Michelle took about 3 days to get back to Davis due to a long and unholy succession of cancelled flights. We've been married for 30 wonderful years, and with both of our children away at college, we've decided to take a break and smell the flowers along life's highway. Terry is taking a 6 month break from his career to pursue the dream of life afloat, and the Admiral (Cathy) has embraced the idea with enthusiasm. 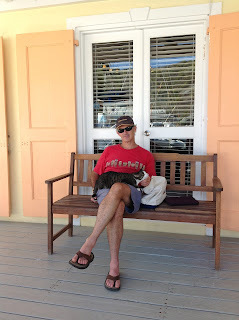 We hope to explore the Caribbean, Turks and Caicos islands, Bahamas and East Coast. Please join us on our travels and post your comments anytime!